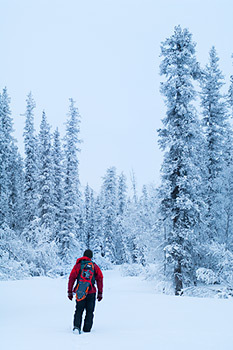 Photo Sale to the CIA - Winter snowshoeing, boreal forest, Wrangell - St. Elias National Park and Preserve, Alaska. To be honest, I’m not trying to hide anyone’s name for security reasons here; I simply didn’t hear anything beyond the words ‘special agent‘. I’d had maybe 3 hours sleep and now ‘special agent‘ is calling at 5:30 in the morning. Freaky stuff. I snuck a little deeper under the bed covers. So it turns out this ‘special agent xxxx’ was calling because a particular ‘federal government agency’ wanted to license one of my images. This is pretty cool, I’m thinking. I watch enough movies to know when a ‘special agent’ is on the phone saying they work for ‘a federal government agency’ that it’s not Health and Human Services calling. So, finally, yes, it turns out this is the CIA calling me. We set out the terms of the license for the image, and then method of payment. I’m thinking we’ll meet under a bridge somewhere, at midnight, with a briefcase, or some such; turns out they want to simply give me a credit card #. I run the card, and it is declined. Round and round, and round we go. What am I gunna do? How does one ‘lean on’ the CIA for payment? In fact, I’m not even sure how I can verify this was actually the CIA – it coulda just been some prankster, or someone wanting a photo sans payment. So, I call the CIA. Turns out it’s pretty difficult to get any information from the desk at the CIA office. I can’t get them to verify the names I give them, the contact info, or anything further. Nor do they verify that those people do NOT work for the CIA. I’m simply told that IF the people I mentioned DO work there, they’ll be notified to contact me asap. The problems I’m running into, as it turns out, are that for the card # to run, I need to actually have an authorized agent on the phone with the bank merchant at the same time I run the card. So we finally figure it out, I get my moola, they get my photo, and it’s all good. For the record, I did ask “special agent —-“, who checked with the supervisor, who called the next supervisor, who called a meeting and finally I was granted permission to post on my blog that I had sold a photo license to the CIA. They asked that I don’t say which one. So I won’t. PS – for those folks interested in moving to Alaska from the East Coast, one word of advice is to get a new cell phone # when you arrive, with an Alaska area code. That way, folks on the east coast tend to not call you at 5:30 in the morning, thinking it’s 9:30am. That is too funny! So you mean to tell me that my taxes (and also yours) have paid for your image at some government official’s office??? 😉 Congrats on the sale! Pretty cool story, Carl. I got a call the other night at 2 a.m. from an area code I didn’t recognize. I had gone to sleep around 1, so I didn’t answer it. I wonder if it was the CIA calling me too?!? That is a classsic story Carl. Congrats. Now I can’t get the song “Secret Agent Man” out of my head. Finally something worthwhile is being done with my tax dollars! Was it an image of Russia as seen from your house? I am not at liberty to answer that question at this point in time. Thank you. That’s too funny. Hope it’s not the one of us going crazy on the Wrangell St Elias Bremner Mine to T(ebay) Lake trip. You know the one with four foreign nationals in it? Just checking – over an out.